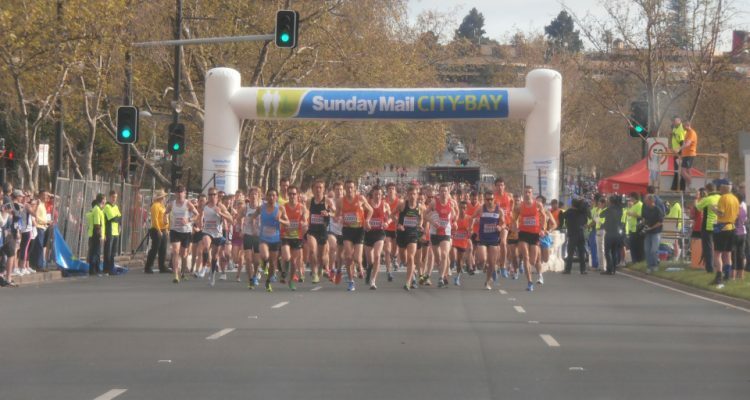 In 2012, the Sunday Mail City Bay Fun Run celebrated its 40th year by smashing numbers with a record 39,003 participants. Runners, walkers and wheelers lined the Adelaide City, Federation Centre at Kurralta Park and SAJC to take part in Australia’s largest Fun Run per head of capita. The event raised money for athletics in South Australia were also able to raise over half a million for over 200 charities. In 2013 the event will be staged on Sunday 15 September and has three starts which are 12k, 6k and 3k extending from the Adelaide City along Anzac Highway to Glenelg. The event is also supported for 12 weeks with workshops providing information about safe training, and wellbeing. The Sunday Mail City Bay Fun Run attracts elite runners and walkers from around Australia, however the main emphasis is on improving health and fitness of our community by encouraging participation for fun and achievement. Participants range in age from children in prams to adults aged over 90, with the majority age range between 20 – 75 years. This year the Sunday Mail City-Bay Fun Run will be holding a 3 day expo at the Adelaide Town Hall-Meeting hall where participants can come and collect their race number, meet our partners, try on official event merchandise and get all their race day information. Elite Runner Start time is at 8.00am – race bib colour will be Orange. Sub 60 min Runner Start time is at 8.00am – race bib colour will be Purple. All other Runners Start time is 10 minute waves post sub 60/elite – race bib colour will be Green. Elite Wheelchair Start time is at 8.00am – race bib colour will be Orange – Assemble at Gresham Place. All Racing Wheelchairs Start time is 8.10am – race bib colour will be Maroon – Assemble at Gresham Place. Walkers Start time is at 9am – race bib colour will be Salmon Pink. Leave in 10 minute waves. Asked to line up from competitors to participation for fun. The start line will be on the Northern carriageway of Anzac Highway, you will be required to transfer over to the Southern carriageway before you reach Marion Road. All participants Start time is at 9.45am – race bib colour will be Aqua Blue, wheelchairs Maroon. Transport is available to and from the event for limited hours on the day. Trams will commence operation from Stop 15 (Brighton Road) for the start every 6 minutes from 6:20am until 2:00pm. Trams from Moseley Square will depart every 10 minutes from 2-3pm. If leaving Glenelg after 7:30am please catch the bus provided at the tram stop (Maxwell Terrace) as this will take you closer to the start area, adjacent to the Railway Station on North Terrace. Trams will terminate at Rundle Mall at 7:50am and South Terrace between 7:50 and 10:00am. (A shuttle service will run between South Tce and Government House (North Tce). Trams from the Adelaide Entertainment Centre to Adelaide Railway Station will run a 10 minute service from 6:40am til 10:00am. Between 10am-3pm there will be a high frequency service from the Entertainment Centre to Glenelg. After 3pm vouchers will no longer be valid and you will be required to purchase a ticket. Supported by the Government of South Australia and AdelaideMetro. First shuttle buses will be leaving at 6:30am from Wigley Reserve and Maxwell Terrace arriving at Adelaide Railway Station via the 3 and 6k starts. Buses will continue until 7:45am for the 6k (Kurralta Park). Buses will continue until 8am for the 3k and 12k starts. Buses from Adelaide Railway Station will be returning to Glenelg commencing at 7am for friends and family wishing to head to the finish line.